Since 1909, Audi has been the benchmark of automotive performance. With its several motor sport championships in Le Mans, World Rally, and Grand Touring, Audi vehicles hone in on precision and quality. Constantly on the cutting edge of innovation, Audi automobiles never leave a driver disappointed with their quality. Taking care of Audi vehicles is both our privilege and passion. 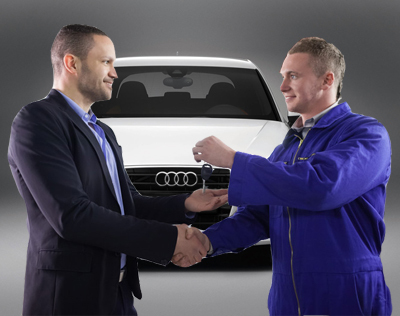 Quality of service in Audi maintenance originates from years of knowledge and experience. Our San Diego Audi service center is here to provide you expert repairs at affordable prices. We are the Audi dealer alternative in San Diego area. Quality workmanship and specialization in Audi’s along with our state of the art equipment sets us apart from the competition. The Original Specialists have been providing auto repair and service to San Diego since 1959. Our ASE certified master technicians have seen almost any problem that can occur in a vehicle. Their knowledge and experience benefits our clients by saving them money and time. We know a car problem can really disrupt your day. We offer free shuttle service and for lengthy repairs we have special rates with Enterprise rent a car. With our 8000 square feet facility your vehicle is never parked outside overnight. Your satisfaction and comfort is our priority. Once the service and repairs are done we will wash your car before we hand you your keys. Keeping you happy with our service, in return, benefits our business with word-of-mouth referrals. The Original Specialists Audi Service Difference. 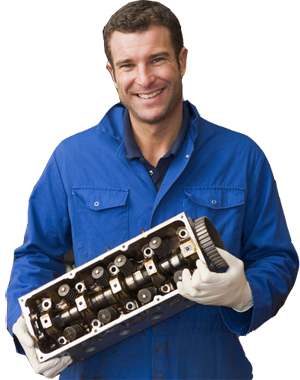 We perform all factory-scheduled maintenance as well as repairs due to normal wear and tear. Our Audi technicians have gone through extensive factory training. We follow Audi of America scheduled maintenance when servicing your Audi. Our technicians are ASE certified master mechanics. We use frequently updated Audi computer diagnostics. Audi vehicles have some common problems you might encounter. Here are a few of the most common problems and the causes. Of course the best practice is to always bring your car in for a comprehensive inspection so we can pin point the cause of your problems. Is Your Audi Leaking Oil? Audi engines, in particular the V6, commonly leak from the valve covers and tensioner gasket seals. Naturally, leaking oil can be a fire hazard – the oil reaching the exhaust and burning while you drive is the smell, so it’s best to take care of the problem as quickly as possible. Leaking oil can additionally be a threat to the engine electronics. Oil permeates through the wiring and can invade electrical connections or damage control modules. Which can often generate very unusual results and becomes increasingly costly the longer it is left alone? At an early stage, the seeping oil is hidden by the engine belly pan. So, if you are finding oil on your driveway, the issue is in full swing and we would suggest attending to it ASAP. With leaking oil, the longer the problem goes the less oil you have in your engine – this could be catastrophic. Do You Have A Bad Odor in The Vehicle? This is a musty smell that originates from the heating and ventilation system. In most cases, this odor will take place if your Audi has sat for a few hours. Of course, there are a number of different causes for odors, but commonly mold increasing in the ac ducting system is the usual source. The mold spores are present in the air and accumulate with moister extraction in the ac process. Left for a while in the warm summer temperature they grow rapidly. We can provide a cleaning system that eliminates the mold accumulation and eliminates the odor. Having said that, this is typically needs to be done once a season as the issue cannot be completely eliminated. Is Your Audi Making Clunking Sounds During Sharp Turns? This is usually the outcome of neglecting a previous repair work needed on an axle CV Boot. One of the most common causes of this noise on an Audi is the drying of an axle joint. When the CV Boot has been torn, the grease gets thrown out and the joint dries out and starts to wear quickly. If your CV boots are torn, then you are driving on borrowed time before this repair is necessary. If a check engine light stays on after a number of drive cycles and the engine runs normally the source of the problem is commonly an emissions related issue. Commonly on Audi vehicles this is a leak in the emissions gas recycling system, although typically, there are a variety of typical reasons that could set this situation. The worst situation is a catalytic converter inefficiency problem in which the exhaust gases are not being properly cleaned by the cat. In many cases, catalytic converters are paid for under warranty for 8 years or 80K miles. Is Your Low Coolant Light On? Audis routinely have issues with a low coolant light coming on or a noticeable coolant leak underneath the vehicle. There are a number of different reasons why this takes place; nonetheless, the most common is a fracture in the coolant reservoir. Usually the leak is not noticeable until the car has warmed up enough to open the crack as the coolant expands to the crack level. The leaking coolant will generally reach an exhaust component first and evaporate – this makes the leak difficult to notice. Changing the coolant reservoir is a fairly inexpensive job – certainly if compared to the price of damage resulting from over-heating. Summary: I have never had a mechanic treat me with such respect. Way to go, guys! Description: Many thanks to Tom and Mike for taking the time to explain my options carefully and honestly. They made sure I understood what my Audi A6 needed to get on the road again. I have never had a mechanic treat me with such respect. Way to go, guys!